BlackBerry has confirmed BBM for iOS and Android will be gaining new features "within months" as Voice and Video calls are lined up to join the IM offering. 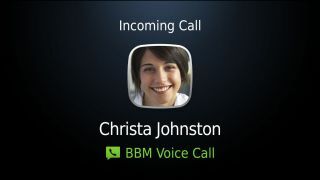 Anyone currently rocking a BlackBerry 10 device can make free voice and video calls (as long as your data plan/Wi-Fi covers it) to other BlackBerry users using the Canadian firm's BBM application - but these features are set to become more universal. Andrew Bocking, BlackBerry's VP of BBM, confirmed to Canadian broadcaster CBC that the update to the newly launched BBM app for Google and Apple devices would be arriving in the near future. BlackBerry offers its BBM service free of charge and it raised eyebrows when it announced that its premium messaging service would be taking the leap onto rival platforms - especially considering the firm's rocking financial standing. There is a money-making end game however, with Bocking also confirmed that the BBM Channels feature would be making the transition to Android and iOS soon - although we're still waiting for an exact release date. BBM Channels are, in short, a way for companies to gain a presence on BBM and ultimately a way for BlackBerry to sell ads and sponsored posts on the platform - think of them like Facebook Pages merged with company Twitter accounts. While Channels is yet to take off it a big way just yet, the addition of 10 million new BBM users on two new platforms could well boost the appeal and eventually make BlackBerry a few bucks in the process.